Pictured at the ceremony are Margaret Jordan, Greg Karpakis, Suzanne Cleary and Owen Clifford, head of retail convenience, Bank of Ireland. The Galway-based EPOS providers JBM Merit have retained their title as Best Retail Technology Providers in the country at a top national awards ceremony. In the process, for the second year, they have seen off significant competition at The National Convenience Store Awards. “We were so delighted to receive the Best Retail Technology Award in 2017; it meant a tremendous deal to the company. To retain the title for a second year running is a fantastic achievement for any company. It indicates our business has the right approach and continues to move in the right direction” said Suzanne Cleary, Head of Marketing and Business Development. “It is an endorsement to all our team; we are very passionate about the products and services we provide. We have over 25 years experience providing intelligent epos solutions to the retail industry and 2019 will see us continue to work hard to further develop ourselves,” said Margaret Jordan, Co-Owner. “For us, listening to our customer’s feedback is very important. We would like to sincerely thank all our supportive customers who continually believe in us,” said JBM Merit’s Greg Karpakis. More than 400 people representing over 60 companies attended the glitzy, black-tie ceremony at The City West Hotel in competition for the 41 awards presented on the night. 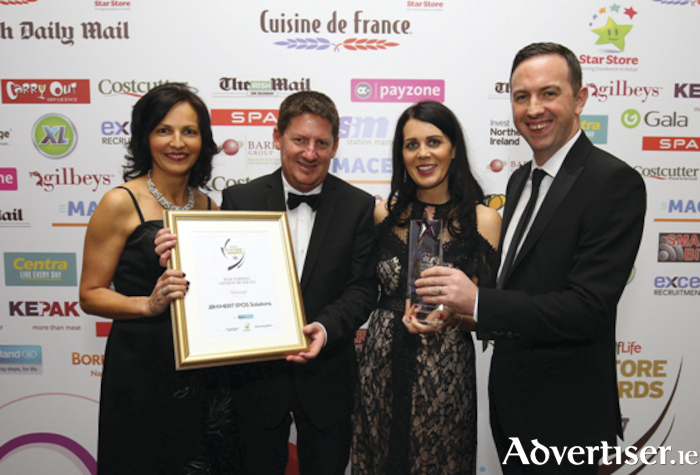 As Ireland’s only independently-judged awards programme for the convenience store sector, each of the entry categories are recognised and rewarded through best practice of retailing in all its key areas of operation.